L&S Discount Pharmacy and Parata go way back. As a pharmacy with one of the first 100 Robotic Dispensing Systems (RDS) in use, L&S was already familiar with Parata’s approach to improving pharmacy workflow. So, when Tripp Logan and his father Richard made plans to roll out a new medication adherence program that consolidates patients’ medications, increases convenience, and establishes regular, high-value touch points, they trusted Parata’s Max to help. “We weren’t helping our patients manage their chronic conditions — we were reacting to their medication needs four to six times each month,” says Tripp. L&S transitioned chronically ill patients on multiple medications to their new adherence program and — bolstered by the speed and efficiency of Max — was able to improve the quality of care for their patients as well as their own workflow. 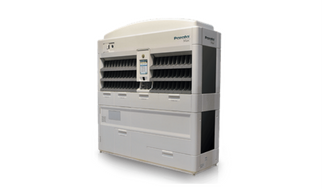 Because the most common prescriptions in the adherence initiative are chronic medications, fast movers and generics, L&S is able to automate up to 70 percent of the program’s fills with Parata Max dispensing solution. It’s been 10 years since the pharmacy team embraced Max, impressed by its speed and ability to keep working through medication, vial, and cap replenishment. With Max’s help, the team at L&S was able to launch an adherence plan so successful it caught the eye of many in the industry. It wasn’t long before L&S could prove their success. In 2009, the National Alliance of State Pharmacy Associations asked L&S Pharmacy to participate in a national pilot program around adherence. Results were so amazing that Pfizer couldn’t get enough. They analyzed five years of data to show the business impact of the adherence program, including significant increases in adherence measures, profit margins, and generic utilization. With data telling such a successful story, L&S wasn’t about to stop just because the numbers were in. The Logans developed MedHere Today®, a comprehensive medication adherence service providing pharmacists with tools to create and track the impact of adherence programs. “With MedHere Today, we’ve built a network of more than 60 pharmacies focused on patient care and prepared to make a difference in the health care system,” explains Tripp. Back in 2009, the goal was to just get all a patient’s medications in sync, but L&S not only focused on syncing tablets but also coordinating sales and delivery. With Max enabling the team to spend more time on patients and their care, L&S has continued to see their business grow. With so much at stake, timing is everything. Before they open, when they’re open, and while the team is caring for patients, Max ensures L&S can fill a whole lot of scripts with minimal burden on staff. Having upgraded a few parts here and there over the years, Tripp says he’s met a few Parata techs and has been impressed by them all.